More in my series of old movies and the designer behind the title sequence. The titles open up with Rock Hudson on one side and Doris Day on the other. The title and credits appear in the middle panel, with Day and Hudson throw pillows back and forth that wipe the text on and off the screen. The music is a peppy Doris Day tune, which sets up the light hearted comedy nicely. There are several split screen sequences carried throughout the film, which work really well with the story. Fitzgerald worked at Pacific Title & Art Studio, which did all the work for all the film title work for Warner Bros., MGM, and 20th Century Fox but neither Pacific Title nor its employees received title design credit. Fitzgerald was responsible for many titles including the amazing The Music Man, My Fair Lady; as well as TV shows, including The Beverly Hillbillies and Mr. Ed. In 1967 he opened his own firm and continued doing such titles as Chinatown, The Big Chill and Diabolique. 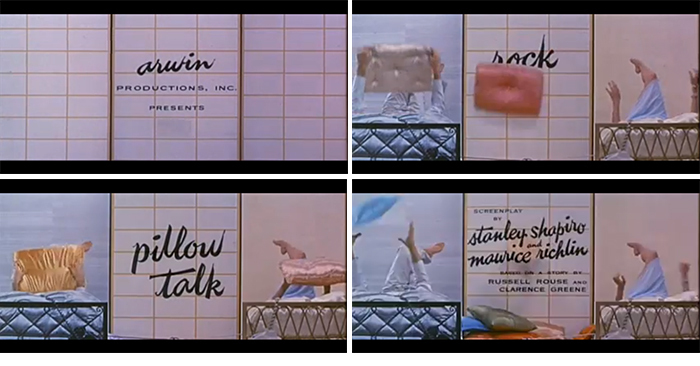 More on the long list of Fitzgerald’s titles here, and the full title sequence for Pillow Talk can be found here.